Michigan, 1883. In Her Darkest Hours, Is He the Man She Needs? I enjoyed this book. A lot. I’m glad I read it and I’m going to tell you what I loved about it. But first, I need to get a little rant off my chest. So here goes…. I liked Lily, honestly I did, but it drove me crazy the way she ignored offers of help and instead went off on well-meaning but foolhardy and poorly planned rescue attempts by herself. I’m reminded of the kind of advice I have to give my 3- and 6-year old kids on occasion: Just because the window didn’t break the last time you threw something at it doesn’t mean you can keep throwing things at it and expect it never to break. So yes, Lily, someone needs to do something quickly, but if you get yourself captured or killed in the process, then you’ll be in no position to accomplish anything for anyone. Yes, I realize you’ve rescued other girls before and you feel passionately about this. But that doesn’t make you invincible or negate the need to think things through ahead of time. The Northern Michigan lumber camps of the time period were vividly described right down to the last frosty detail. The historical information included was pretty fascinating. And the fact that the bad guy in this story and some of his actions were based on a real life person and real life circumstances was more than a little disturbing. The storyline definitely makes an impression! Lily’s selfless determination to help others in need was admirable. And I found her love for her sister as demonstrated by the lengths she went to in searching for her touching. I thought Connell was a great match for her, helping to temper her impulsiveness, even as she spurred him on to action rather than complacency. At heart, he was a good guy, and very likeable. And I was glad to see his character growth over time. So true. And I love the balanced and well-articulated way that idea is expressed. Between the romance, the suspense, and the weighty issues dealt with, this book kept my attention riveted from beginning to end. I’m glad I took the time to read… or technically (since I bought the audio edition), listen to it. I thought the narration was well done with a clear and articulate reading, and I would encourage audiobook readers to seek out the audio edition. Despite a large cast of characters, narrator Julia Whelan manages to differentiate their voices well. I particularly enjoyed the Old World brogue incorporated into the voices of Mr. and Mrs. McCormick. Throughout the novel, each character’s voice was uniquely hers or his, yet consistent from scene to scene. In many cases, the voice selected was so well matched to the character’s personality that the voice became inseparable from the character in my mind. Quite the performance! Karen Witemeyer’s latest novel, Full Steam Ahead, takes her signature blend of witty romance, faith, and history from the ranches of earlier books into the world of the steamboat. Specifically, to an 1800’s Texas plantation where a reclusive scientist performs explosive experiments designed to improve the safety of steam engines, and thereby prevent future casualties. Nicole and Darius make great romantic leads. They’re both intelligent and highly motivated characters with interesting backgrounds that just happen to make them perfect for each other… even if they don’t see it at first. But their chemistry… wow. I loved watching their romance develop, and particularly the way they impact each other’s faith journeys. But that’s not all. Witemeyer also provides some thoroughly charming and entertaining secondary characters. Not to mention a pair of villains out to steal a treasured family heirloom who season the story with just the right dash of suspense, leading up to an exciting conclusion with a bit of an unexpected but surprisingly satisfying twist. Definitely worth the read. I must confess that when I read a couple of reviews by listeners who described the narrator’s voice as “old sounding” I was a bit concerned about whether this would be an audiobook I could recommend. It is, after all, a book about young people. Would the voices work? I re-read the book’s description, listened to the audio sample, and decided to take a chance on reviewing it. I’m happy to say I was not disappointed. Carine Montbertrand’s performance perfectly captures the wry humor of the novel, and gives life to the characters’ voices and emotions. Her use of lovely French accents comes in handy for the voices of some of the secondary characters, as well as names of French origin. Both male and female voices sound authentic and entirely appropriate for their ages. At times, I did detect a slight gravelly quality to the narrator’s voice, primarily at moments when her voice dipped into the lower registers during passages of narrative description, but I found this didn’t bother me at all, and even seemed to disappear into the background as I grew accustomed to her reading style and got lost in the story. Overall, I found the listening experience to be a very pleasant one, and I am happy to recommend it. Thank you to Recorded Books for providing me with a copy of this audiobook for review purposes. My monthly “Three for the Books” post is where I feature new (Hot off the Presses), best selling (Topping the Charts), and award winning (Cream of the Crop) Christian fiction books. I select one title to feature in each category, as well as providing links to where you can browse additional newly released, best selling, and award winning titles. Have you read any of my featured titles? Any others you’d like to give a shout-out? Comments are always welcome! Kathryn Springer’s The Dandelion Field (Zondervan, January 2015) caught my attention while browsing the Christian fiction titles releasing this month and I’ve decided to make it my “Hot Off the Presses” book of the month. I haven’t had the chance to read it yet, but I do love contemporary romance, and this one looks like it grapples with some tough issues. Perhaps a good book discussion group selection? About the Book (from Publisher, Zondervan): This handsome firefighter makes a living coming to the rescue, but Gin doesn’t need a man to fight her battles. Want to browse some more Christian fiction titles releasing this month? NovelCrossing and SoulInspirationz both feature lists of new releases, among other interesting things related to Christian fiction. 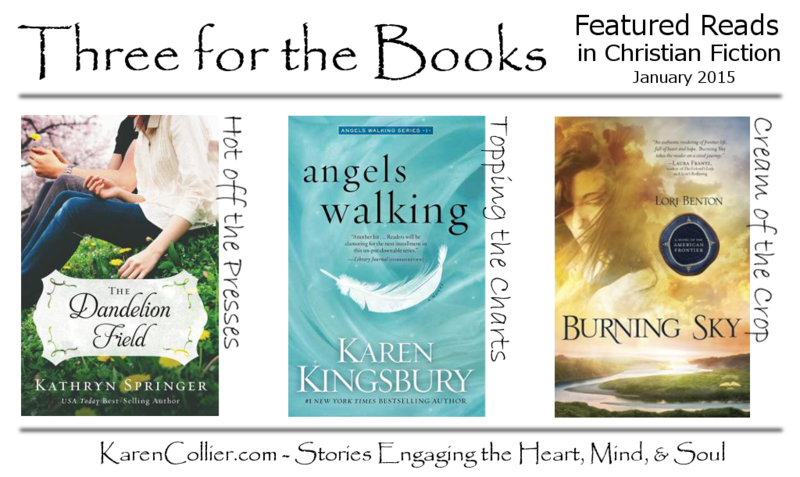 Karen Kingsbury kicked off a new series back in October with the release of Angels Walking, and three months later it’s still way up there on the CBA and ECPA bestseller lists. I read and reviewed it at the time, and found it quite enjoyable. If you haven’t read it yet, you just might want to check out what you’re missing! And for the audiobook fans among us, I’d like to point out that there’s an audiobook edition available (though I haven’t tried that edition myself). If you do, please let me know what you think. About the Book (from Publisher Howard Books): From #1 New York Times bestselling author Karen Kingsbury comes the first in a brand-new series about second chances—a dramatic story about a washed up baseball player, the love he left behind, and the miracles that might save them both. To see what other titles are hot at the moment, check out the Bestseller Lists for Christian fiction. This is the category where I feature an award-winning Christian fiction title. For my inaugural post, I decided to feature the book that won not one but three Christy Awards in the most recent awards cycle. Burning Sky (Waterbrook-Multnomah, August 2013) by Lori Benton was chosen as Christy Award winner in the Historical and First Novel categories, as well as being named Book of the Year. It is also the recipient of the 2013 Grace Award for Historical Fiction. About the Book (from Publisher Waterbrook-Multnomah): Abducted by Mohawk Indians at fourteen and renamed Burning Sky, Willa Obenchain is driven to return to her family’s New York frontier homestead after many years building a life with the People. At the boundary of her father’s property, Willa discovers a wounded Scotsman lying in her path. Feeling obliged to nurse his injuries, the two quickly find much has changed during her twelve-year absence—her childhood home is in disrepair, her missing parents are rumored to be Tories, and the young Richard Waring she once admired is now grown into a man twisted by the horrors of war and claiming ownership of the Obenchain land. To find more titles among the “Cream of the Crop” check out my list of some of the big awards in Christian fiction, with links to the awards’ Web sites, where you can track down some more winners. With all that said, it’s your turn, reader friends. Have you read any of these titles? Do you want to? Are there any other titles you’ve read recently that deserve a shout-out? Please speak up in the comments! Luke Callahan was one of the nation’s most powerful congressmen before his promising career was shadowed in scandal. Eager to share in a new cause and intrigued by a winsome librarian, he joins forces with Anna to solve the mystery of the lost ship. Opposites in every way, Anna and Luke are unexpectedly drawn to each other despite the strict rules forbidding Anna from any romantic entanglements with members of Congress. For a while now, I’ve been wanting to try a book by Elizabeth Camden. After all the wonderful things I’ve heard about her previous books, not to mention the awards they’ve won (Christy Award, RITA, etc), I was already excited to see she had a new title coming out. But when I saw that this one features a librarian as heroine, I knew I had to read it. After all, I’m a librarian too, and who doesn’t like reading books about characters you share something in common with? Beyond All Dreams turned out to be right up my alley. I enjoy a nice sigh-worthy romance as much as the next gal, and this one definitely fits the bill. But there was more to this one. In fact, the elements that really stood out for me were the depth of characterization and the exploration of deeper themes throughout the story. Not to mention some fascinating glimpses into the history of the Library of Congress as well as the start of the Spanish-American War. Both Anna and Luke faced difficult childhoods in different ways, and I found it interesting to see how their childhood experiences as well as their reactions to those experiences shaped the people they grew up to become. It was also fascinating to see how their differences complemented each other, allowing them each to have a significant positive impact on the other. They definitely made a great team, and it was fun watching them working together toward achieving their dreams. Forgiveness and trust play huge thematic roles in the story, taking on significance in a number of relationships both past and present. Then there’s an exploration of the differences between love, friendship, and infatuation. In fact, this book raises all kinds of interesting questions on a variety of topics that would make it really well suited to discussion within a book group. And yes, the book does include discussion questions for that purpose. I can definitely see why Elizabeth Camden’s books have become so popular! I know I’m looking forward to reading more from this author. And I would not hesitate to recommend Beyond All Dreams to fans of inspirational romance and historical fiction. Thank you to publisher Bethany House for providing me with a free electronic copy for review purposes. Fans of epic fantasy in the tradition of J.R.R. Tolkien’s Lord of the Rings and C.S. Lewis’s Chronicles of Narnia would be well advised to find the nearest bookstore (or device capable of downloading ebooks) posthaste. You will not want to miss the start of the new Legends of the Realm series by Thomas Locke (aka Davis Bunn). The parallels with classic fantasy literature found in lead character Hyam’s heroic journey are quite apparent, but the story is told in a style appealing to the modern sensibilities of readers in today’s instant download age of entertainment. What I mean by that is Emissary is a real page turner. The writing style reminds me of a contemporary suspense novel with its short chapters and the sort of clear and easy to follow sentence structures that make a story flow effortlessly on the reader’s part. I quickly grew to know and like the main characters and their down to earth ways and to see the need for them to accept the challenges presented and accomplish the seemingly impossible. The Realm itself came into crystal clear focus, not through long meandering passages of descriptive detail, but through instant immersion, with important facts dropped in as they were needed. The plot advanced quickly from point to point as Hyam mastered necessary skills, faced obstacles, and gathered the support and allies needed on his quest. And it all led up to a thrilling life-or-death climax that I’d love to see rendered on the big screen. Honestly, I think this novel is one with wide appeal. It’s a story of good versus evil and of finding one’s place in the world. It comes from a well-known (by another name) author of Christian fiction and from a Christian publishing house, but is as subtle in its Christian influences as Tolkien’s Lord of the Rings. Thank you to the publisher for providing me with a free copy of Emissary as part of the Revell Reads blog tour program in exchange for my honest review. To learn more about this book, check out the book’s description on the publisher’s Web site or view the book trailer on Youtube. There are also some interesting Q&A posts on the author’s blog and Goodreads page. 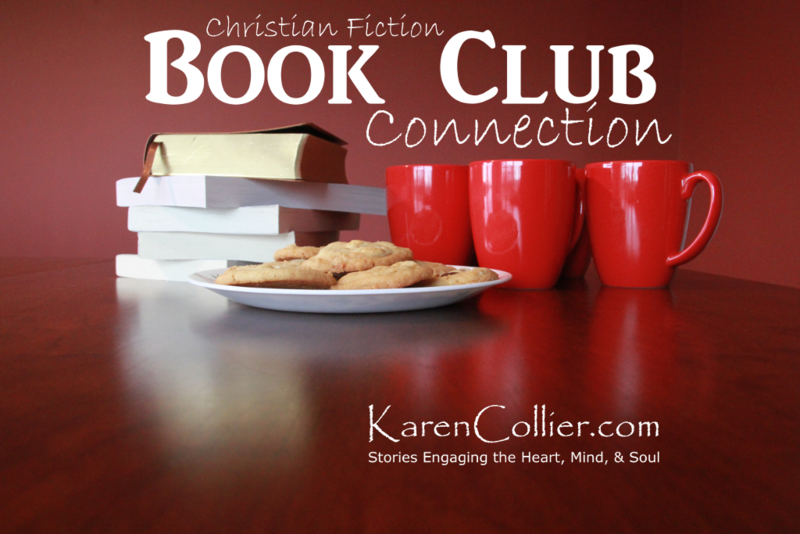 Welcome to the January 2015 edition of the Christian Fiction Book Club Connection. Whether you’re a pastor or ministry leader thinking of forming a book discussion group at your church, a current member of a book club, or simply a fan of Christian fiction hoping to connect with other readers, you’re in the right place! This month’s post includes a featured book that I think is well suited to discussion, as well as links to upcoming online discussions. Then I’ll wrap up the post with a discussion question I’d like YOU to chime in on. This book features a contemporary plot, including a romance, but not focused exclusively on that aspect. It deals with weighty issues at times, making it highly discussable, but it maintains a hopeful outlook and Christian perspective. To learn more about the book, check out the Publisher’s description, read my review, or take a look at this short video featuring the author. I didn’t find discussion questions I could link to online, but the book itself does include ten thought-provoking questions to help get discussion started. The ACFW Book Club is between books at the moment, but if you follow the instructions to subscribe to their e-mail list now, you’ll be among the first to find out which book will be discussed next. For January, the Christian Fiction Devourers group on Goodreads is discussing Chateau of Secrets by Melanie Dobson AND Code Blue (Prescription for Trouble #1) by Richard Mabry. Grab your copies and head on over to the discussion forum to check in with others who are in the midst of reading these books. The Fans of Christian Romance Goodreads group is reading A Man of His Word by Kathleen Fuller for its January discussion. For fans of J.R.R. Tolkien and C.S. Lewis, Jamie of the Books and Beverages blog hosts a monthly Inklings discussion series. Sometimes fiction, sometimes non-fiction, the title for the month of January is The Fellowship of the Ring by J.R.R. Tolkien. Hop on over there on January 21st for what’s sure to be a great discussion. NEW for 2015, is the #HedlundChallenge2015 (details here and here), for which discussion will be hosted in alternating months by Jamie of Books and Beverages and Cassie of Bookshelves and Windows. The first of Jody Hedlund’s books to be discussed is Unending Devotion. Look for the discussion post on Cassie’s blog on January 27th. I got myself an audiobook copy of this month’s book, so hopefully I’ll be finished in time to join in! Since this is the first of these Book Club Connection features, let’s start by introducing ourselves. Please take a moment to leave a comment, even if it’s only to say hi. I hope to get to know the people following this feature and tailor it to fit your interests. To help facilitate that, could you say a little something in your comment about your interest in book groups? For example, are you currently a book discussion group member or leader? Are you looking for a book club to join? Thinking of starting one? Or maybe just curious? Back when I was working as a librarian, I had some training in facilitating book discussion groups, as well as first-hand experience leading and participating in one for several years. In future posts, I hope to talk about the benefits of participating in a book group, how to find or start one, and ideas to help a discussion run smoothly, among other things. But I’d also love to answer questions. If there’s anything book club related you’d like to know, please ask. You can leave your question in a comment or send it to me in an email, and I’ll try to address it in a future Book Club Connection post, as well as opening the floor for discussion on the topic. So, if book clubs are of interest to you, please take a moment to subscribe to this blog, leave a comment introducing yourself, and share the word with others you know who might be interested. (And even if book clubs aren’t your thing, I hope you’ll stick around anyway because I’ve got lots of other fun features here the rest of the month for fans of Christian fiction.) Either way, I’m looking forward to chatting with you! Happy New Year! With everyone thinking about resolutions and new beginnings, I thought this would be a great time to tell you about some brand new features I hope to share on this blog in the coming year. Up to now, my blog has focused primarily on reviews of Christian fiction books and audiobooks, along with the occasional post about my writing journey. Don’t worry! That’s not going away. I love doing those reviews and other posts. But I do want to add some more fun and interactive features into the mix for my readers. So, with the New Year approaching, I’ve been thinking a lot about what other kinds of posts I might like to share on a regular basis. Here are a few ideas that have stuck with me, that I’m planning on trying out in the next few months. As you read about these new features and continue following my blog, I have a request for you. If there are any posts or types of features that you particularly love, please let me know and tell your friends about them, so I can be sure to keep producing the kinds of posts you like best! I’ve seen some great author interviews featured on other blogs, and I want to get in on the fun too! I’m hard at work brainstorming what I hope will be original, thought provoking, and entertaining questions, as well as plotting and planning who to approach when (and how). On my interviewee wish list: authors of Christian fiction, book bloggers, and publishing industry professionals like agents, editors, cover designers, publicists, etc. I’m thinking big and we’ll see where it goes…. I’ve been sharing links about upcoming online “Book Discussions in Christian Fiction” on a monthly basis for a while now. Since July, in fact. But I want to take that a step further, and take a more active role in promoting and encouraging Christian fiction book clubs. I’m envisioning a monthly post called “Book Club Connection” with one or more parts in each post. These might include a featured book that I think would be well suited for discussion, links to upcoming discussions, tips and thoughts for book groups, and discussion prompts of interest to current and future book group participants about topics like what makes a book group work well, etc. Why the interest in book clubs? That could be a whole post for another day. But here’s the short answer. I enjoyed my time leading and participating in a book club. And I think book discussion groups are a great opportunity to share a love of favorite books and authors with other readers, while discovering additional books you might not have otherwise picked up. Win-win! This one is kind of tangential to Christian fiction, but I think it’ll be fun. In each “Musical Inspiration” post, I plan to feature one of my favorite contemporary Christian songs, with a few words about what I like best about it, along with links for those wanting to listen for themselves. My theory is that many of the same people who enjoy reading Christian fiction would also tend to be fans of Christian music. Yes? Anyway, I find music to be incredibly inspiring both in my life and in my writing. I can’t wait to share some of my favorites with you, and hopefully hear about some of your favorites too. Want to chat about books, blogging, reading formats, genres, plot & character elements, or really anything related to Christian fiction? I’m hoping to host some discussions here on the blog in 2015. To that end I’ll be creating occasional blog posts intended as conversation starters, each featuring a discussion question of some sort, inviting you to weigh in with your opinion. So… a preliminary question as I begin planning questions… are there any topics you’re especially keen to talk about? Thanks for reading! If any of my shiny new post ideas have caught your attention (or you just plain love book and audiobook reviews), I hope you’ll plan on following my blog in the coming year. I’d love to chat with you!